wx.richtext.RichTextCtrl provides a generic, ground-up implementation of a text control capable of showing multiple styles and images. wx.richtext.RichTextCtrl sends notification events: see wx.richtext.RichTextEvent. It also sends the standard wx.TextCtrl events wxEVT_TEXT_ENTER and wxEVT_TEXT , and wx.TextUrlEvent when URL content is clicked. For more information, see the RichTextCtrl Overview. wx.richtext.RE_CENTRE_CARET: The control will try to keep the caret line centred vertically while editing. wx.richtext.RE_CENTER_CARET is a synonym for this style. wx.richtext.RE_MULTILINE: The control will be multiline (mandatory). wx.richtext.RE_READONLY: The control will not be editable. AddImage Adds an image to the control’s buffer. AddParagraph Adds a new paragraph of text to the end of the buffer. AppendText Sets the insertion point to the end of the buffer and writes the text. ApplyAlignmentToSelection Applies the given alignment to the selection or the default style (undoable). ApplyBoldToSelection Apples bold to the selection or the default style (undoable). ApplyItalicToSelection Applies italic to the selection or the default style (undoable). ApplyStyle Applies the style sheet to the buffer, matching paragraph styles in the sheet against named styles in the buffer. ApplyStyleSheet Applies the style sheet to the buffer, for example if the styles have changed. ApplyTextEffectToSelection Applies one or more TextAttrEffects flags to the selection (undoable). ApplyUnderlineToSelection Applies underline to the selection or the default style (undoable). AutoComplete Call this function to enable auto-completion of the text typed in a single-line text control using the given choices. AutoCompleteDirectories Call this function to enable auto-completion of the text using the file system directories. AutoCompleteFileNames Call this function to enable auto-completion of the text typed in a single-line text control using all valid file system paths. BatchingUndo Returns True if undo commands are being batched. BeginBatchUndo Starts batching undo history for commands. BeginCharacterStyle Begins using the named character style. BeginFontSize Begins using the given point size. BeginLeftIndent Begins applying a left indent and subindent in tenths of a millimetre. BeginLineSpacing Begins appling line spacing. BeginListStyle Begins using a specified list style. BeginNumberedBullet Begins a numbered bullet. BeginParagraphStyle Begins applying the named paragraph style. BeginStandardBullet Begins applying a symbol bullet. BeginStyle Begins applying a style. BeginSuppressUndo Starts suppressing undo history for commands. CanCopy Returns True if selected content can be copied to the clipboard. CanCut Returns True if selected content can be copied to the clipboard and deleted. CanDeleteRange Can we delete this range? Sends an event to the control. CanDeleteSelection Returns True if selected content can be deleted. CanEditProperties Returns True if we can edit the object’s properties via a GUI. CanInsertContent Can we insert content at this position? Sends an event to the control. CanPaste Returns True if the clipboard content can be pasted to the buffer. CanRedo Returns True if there is a command in the command history that can be redone. CanUndo Returns True if there is a command in the command history that can be undone. ChangeValue Sets the new text control value. Clear Clears the buffer content, leaving a single empty paragraph. ClearAvailableFontNames Clears the cache of available font names. ClearListStyle Clears the list style from the given range, clearing list-related attributes and applying any named paragraph style associated with each paragraph. Command Sends the event to the control. Copy Copies the selected content (if any) to the clipboard. Create Creates the underlying window. Cut Copies the selected content (if any) to the clipboard and deletes the selection. Delete Deletes the content within the given range. DeleteSelectedContent Deletes content if there is a selection, e.g. DeleteSelection Deletes the content in the selection, if any. DiscardEdits Sets the buffer’s modified status to False, and clears the buffer’s command history. DoGetBestSize Currently this simply returns wx.Size. DoLoadFile Helper function for LoadFile . DoSaveFile Helper function for SaveFile . DoesSelectionHaveTextEffectFlag Returns True if all of the selection, or the content at the current caret position, has the supplied TextAttrEffects flag(s). EditProperties Edits the object’s properties via a GUI. EnableVerticalScrollbar Enable or disable the vertical scrollbar. EnableVirtualAttributes Pass True to let the control use virtual attributes. EndAllStyles Ends application of all styles in the current style stack. EndBatchUndo Ends batching undo command history. EndCharacterStyle Ends application of a named character style. EndFontSize Ends using a point size. EndListStyle Ends using a specified list style. EndNumberedBullet Ends application of a numbered bullet. EndParagraphStyle Ends application of a named paragraph style. EndStandardBullet Begins applying a standard bullet. EndStyle Ends the current style. EndSuppressUndo Ends suppressing undo command history. EndSymbolBullet Ends applying a symbol bullet. EndTextColour Ends applying a text colour. EndURL Ends applying a URL. ExtendSelection Helper function for extending the selection, returning True if the selection was changed. FindCaretPositionForCharacterPosition Find the caret position for the combination of hit-test flags and character position. FindContainerAtPoint Finds the container at the given point, which is assumed to be in client coordinates. FindNextWordPosition Helper function for finding the caret position for the next word. FindRangeForList Given a character position at which there is a list style, find the range encompassing the same list style by looking backwards and forwards. GetAdjustedCaretPosition The adjusted caret position is the character position adjusted to take into account whether we’re at the start of a paragraph, in which case style information should be taken from the next position, not current one. GetAvailableFontNames Font names take a long time to retrieve, so cache them (on demand). GetBasicStyle Gets the basic (overall) style. GetBuffer Returns the buffer associated with the control. GetCaretAtLineStart Returns True if we are showing the caret position at the start of a line instead of at the end of the previous one. GetCaretPosition Returns the current caret position. GetCaretPositionForDefaultStyle Returns the caret position since the default formatting was changed. GetCaretPositionForIndex Returns the caret height and position for the given character position. GetCommandProcessor Gets the command processor associated with the control’s buffer. GetContextMenu Returns the current context menu. GetContextMenuPropertiesInfo Returns an object that stores information about context menu property item(s), in order to communicate between the context menu event handler and the code that responds to it. GetDefaultStyleEx Returns the current default style, which can be used to change how subsequently inserted text is displayed. GetDelayedLayoutThreshold Gets the size of the buffer beyond which layout is delayed during resizing. GetDragStartPoint Get the possible Drag’n’Drop start point. GetDragStartTime Get the possible Drag’n’Drop start time. GetDragging Returns True if we are extending a selection. GetFilename Gets the current filename associated with the control. GetFirstVisiblePoint Returns the first visible point in the window. GetFirstVisiblePosition Returns the first visible position in the current view. GetFocusObject Returns the wx.richtext.RichTextObject object that currently has the editing focus. GetHandlerFlags Returns flags that change the behaviour of loading or saving. GetHint Returns the current hint string. GetInsertionPoint Returns the current insertion point. GetInternalSelectionRange Returns the selection range in character positions. GetLastPosition Returns the last position in the buffer. GetLineLength Returns the length of the specified line in characters. GetLineText Returns the text for the given line. GetLogicalPoint Transforms physical window position to logical (unscrolled) position. GetMargins Returns the margins used by the control. GetNumberOfLines Returns the number of lines in the buffer. GetPhysicalPoint Transforms logical (unscrolled) position to physical window position. GetPreDrag Are we trying to start Drag’n’Drop? GetPropertiesMenuLabel Gets the object’s properties menu label. GetRange Gets the text for the given range. GetScale Returns an overall scale factor for displaying and editing the content. GetScaledPoint Returns a scaled point. GetScaledRect Returns a scaled rectangle. GetScaledSize Returns a scaled size. GetSelection Returns the range of the current selection. GetSelectionAnchor Returns an anchor so we know how to extend the selection. GetSelectionAnchorObject Returns the anchor object if selecting multiple containers. GetSelectionRange Returns the selection range in character positions. GetStringSelection Returns the text within the current selection range, if any. GetStyle Gets the attributes at the given position. GetStyleForRange Gets the attributes common to the specified range. GetStyleSheet Returns the style sheet associated with the control, if any. GetTextCursor Returns the text (normal) cursor. GetURLCursor Returns the cursor to be used over URLs. GetUncombinedStyle Gets the attributes at the given position. GetUnscaledPoint Returns an unscaled point. GetUnscaledRect Returns an unscaled rectangle. GetUnscaledSize Returns an unscaled size. GetValue Returns the content of the entire control as a string. GetVerticalScrollbarEnabled Returns True if the vertical scrollbar is enabled. GetVirtualAttributesEnabled Returns True if this control can use virtual attributes and virtual text. GetVisibleLineForCaretPosition Internal helper function returning the line for the visible caret position. HasCharacterAttributes Test if this whole range has character attributes of the specified kind. HasParagraphAttributes Test if this whole range has paragraph attributes of the specified kind. HasSelection Returns True if there is a selection and the object containing the selection was the same as the current focus object. HasUnfocusedSelection Returns True if there was a selection, whether or not the current focus object is the same as the selection’s container object. HitTest Finds the character at the given position in pixels. HitTestXY Finds the character at the given position in pixels. Init Initialises the members of the control. Invalidate Invalidates the whole buffer to trigger painting later. IsDefaultStyleShowing Returns True if the user has recently set the default style without moving the caret, and therefore the UI needs to reflect the default style and not the style at the caret. IsEditable Returns True if the control is editable. IsEmpty Returns True if the control is currently empty. IsModified Returns True if the buffer has been modified. IsMultiLine Returns True if the control is multiline. IsPositionVisible Returns True if the given position is visible on the screen. IsSelectionAligned Returns True if all of the selection is aligned according to the specified flag. IsSelectionBold Returns True if all of the selection, or the content at the caret position, is bold. IsSelectionItalics Returns True if all of the selection, or the content at the caret position, is italic. IsSelectionUnderlined Returns True if all of the selection, or the content at the caret position, is underlined. IsSingleLine Returns True if the control is single-line. KeyboardNavigate Helper function implementing keyboard navigation. LayoutContent Lays out the buffer, which must be done before certain operations, such as setting the caret position. LineBreak Inserts a line break at the current insertion point. LoadFile Loads content into the control’s buffer using the given type. MarkDirty Marks the buffer as modified. MoveCaret Move the caret to the given character position. MoveCaretBack Move the caret one visual step forward: this may mean setting a flag and keeping the same position if we’re going from the end of one line to the start of the next, which may be the exact same caret position. MoveCaretForward Move the caret one visual step forward: this may mean setting a flag and keeping the same position if we’re going from the end of one line to the start of the next, which may be the exact same caret position. MoveDown Moves the caret down. MoveEnd Moves to the end of the buffer. MoveHome Moves to the start of the buffer. MoveToLineEnd Moves to the end of the line. MoveToLineStart Moves to the start of the line. MoveToParagraphEnd Moves to the end of the paragraph. MoveToParagraphStart Moves to the start of the paragraph. MoveUp Moves to the start of the paragraph. Newline Inserts a new paragraph at the current insertion point. NumberList Numbers the paragraphs in the given range. OnClear Standard handler for the wx.ID_CLEAR command. OnContextMenu Shows a standard context menu with undo, redo, cut, copy, paste, clear, and select all commands. OnCopy Standard handler for the wx.ID_COPY command. OnCut Standard handler for the wx.ID_CUT command. OnDropFiles Loads the first dropped file. OnPaste Standard handler for the wx.ID_PASTE command. OnProperties Standard handler for property commands. OnRedo Standard handler for the wx.ID_REDO command. OnSelectAll Standard handler for the wx.ID_SELECTALL command. OnUndo Standard handler for the wx.ID_UNDO command. OnUpdateClear Standard update handler for the wx.ID_CLEAR command. OnUpdateCopy Standard update handler for the wx.ID_COPY command. OnUpdateCut Standard update handler for the wx.ID_CUT command. OnUpdatePaste Standard update handler for the wx.ID_PASTE command. OnUpdateProperties Standard update handler for property commands. OnUpdateRedo Standard update handler for the wx.ID_REDO command. OnUpdateSelectAll Standard update handler for the wx.ID_SELECTALL command. OnUpdateUndo Standard update handler for the wx.ID_UNDO command. PageDown Moves one or more pages down. PageUp Moves one or more pages up. PaintAboveContent Other user defined painting after everything else (i.e. all text) is painted. Paste Pastes content from the clipboard to the buffer. PopStyleSheet Pops the style sheet from top of stack. PositionCaret Internal function to position the visible caret according to the current caret position. PositionToXY Converts a text position to zero-based column and line numbers. PrepareContent Prepares the content just before insertion (or after buffer reset). PrepareContextMenu Prepares the context menu, optionally adding appropriate property-editing commands. ProcessBackKey Processes the back key. ProcessMouseMovement Processes mouse movement in order to change the cursor. PromoteList Promotes or demotes the paragraphs in the given range. PushStyleSheet Push the style sheet to top of stack. Redo Redoes the current command. RefreshForSelectionChange Refreshes the area affected by a selection change. Remove Removes the content in the specified range. Replace Replaces the content in the specified range with the string specified by value. SaveFile Saves the buffer content using the given type. ScrollIntoView Scrolls position into view. SelectAll Selects all the text in the buffer. SelectWord Selects the word at the given character position. SetAndShowDefaultStyle Sets attr as the default style and tells the control that the UI should reflect this attribute until the user moves the caret. SetBasicStyle Sets the basic (overall) style. SetCaretAtLineStart Sets a flag to remember that we are showing the caret position at the start of a line instead of at the end of the previous one. SetCaretPosition Sets the caret position. SetCaretPositionAfterClick Sets up the caret for the given position and container, after a mouse click. SetCaretPositionForDefaultStyle Set the caret position for the default style that the user is selecting. SetContextMenu Sets the current context menu. SetDefaultStyle Sets the current default style, which can be used to change how subsequently inserted text is displayed. SetDefaultStyleToCursorStyle Sets the default style to the style under the cursor. SetDelayedLayoutThreshold Sets the size of the buffer beyond which layout is delayed during resizing. SetDragStartPoint Set the possible Drag’n’Drop start point. SetDragStartTime Set the possible Drag’n’Drop start time. SetDragging Sets a flag to remember if we are extending a selection. SetEditable Makes the control editable, or not. SetFilename Sets the current filename. SetFocusObject Sets the wx.richtext.RichTextObject object that currently has the editing focus. SetFont Sets the font, and also the basic and default attributes (see wx.richtext.RichTextCtrl.SetDefaultStyle ). SetHandlerFlags Sets flags that change the behaviour of loading or saving. SetHint Sets a hint shown in an empty unfocused text control. SetInsertionPoint Sets the insertion point and causes the current editing style to be taken from the new position (unlike wx.richtext.RichTextCtrl.SetCaretPosition ). SetInsertionPointEnd Sets the insertion point to the end of the text control. SetInternalSelectionRange Sets the selection range in character positions. SetListStyle Sets the list attributes for the given range, passing flags to determine how the attributes are set. SetMargins Attempts to set the control margins. SetMaxLength Sets the maximum number of characters that may be entered in a single line text control. SetPreDrag Set if we’re trying to start Drag’n’Drop. SetProperties Sets the properties for the given range, passing flags to determine how the attributes are set. SetScale Sets an overall scale factor for displaying and editing the content. SetSelection Sets the selection to the given range. SetSelectionAnchor Sets an anchor so we know how to extend the selection. SetSelectionAnchorObject Sets the anchor object if selecting multiple containers. SetSelectionRange Sets the selection to the given range. SetStyle Sets the attributes for the given range. SetStyleEx Sets the attributes for the given range, passing flags to determine how the attributes are set. SetStyleSheet Sets the style sheet associated with the control. SetTextCursor Sets the text (normal) cursor. SetURLCursor Sets the cursor to be used over URLs. SetValue Replaces existing content with the given text. SetupScrollbars A helper function setting up scrollbars, for example after a resize. ShouldInheritColours Return True from here to allow the colours of this window to be changed by InheritAttributes . ShowContextMenu Shows the given context menu, optionally adding appropriate property-editing commands for the current position in the object hierarchy. ShowPosition Scrolls the buffer so that the given position is in view. SuppressingUndo Returns True if undo history suppression is on. Undo Undoes the command at the top of the command history, if there is one. WordLeft Moves a number of words to the left. WordRight Move a nuber of words to the right. WriteField Writes a field at the current insertion point. WriteImage Write a bitmap or image at the current insertion point. WriteTable Write a table at the current insertion point, returning the table. WriteText Writes text at the current position. WriteTextBox Write a text box at the current insertion point, returning the text box. XYToPosition Translates from column and line number to position. RichTextCtrl provides a generic, ground-up implementation of a text control capable of showing multiple styles and images. Constructor, creating and showing a rich text control. id (wx.WindowID) – Window identifier. The value ID_ANY indicates a default value. value (string) – Default string. pos (wx.Point) – Window position. size (wx.Size) – Window size. style (long) – Window style. Adds an image to the control’s buffer. Adds a new paragraph of text to the end of the buffer. Sets the insertion point to the end of the buffer and writes the text. Applies the given alignment to the selection or the default style (undoable). For alignment values, see wx.TextAttr. Apples bold to the selection or the default style (undoable). Applies italic to the selection or the default style (undoable). Applies the style sheet to the buffer, matching paragraph styles in the sheet against named styles in the buffer. This might be useful if the styles have changed. If sheet is None, the sheet set with SetStyleSheet is used. Currently this applies paragraph styles only. Applies the style sheet to the buffer, for example if the styles have changed. Applies one or more TextAttrEffects flags to the selection (undoable). If there is no selection, it is applied to the default style. Applies underline to the selection or the default style (undoable). Call this function to enable auto-completion of the text typed in a single-line text control using the given choices. Notice that currently this function is only implemented in wxGTK2, wxMSW and OSX/Cocoa (for wx.TextCtrl only, but not for wx.ComboBox) ports and does nothing under the other platforms. True if the auto-completion was enabled or False if the operation failed, typically because auto-completion is not supported by the current platform. Enable auto-completion using the provided completer object. This method should be used instead of AutoComplete overload taking the array of possible completions if the total number of strings is too big as it allows returning the completions dynamically, depending on the text already entered by user and so is more efficient. The specified completer object will be used to retrieve the list of possible completions for the already entered text and will be deleted by wx.TextEntry itself when it’s not needed any longer. Notice that you need to include /textcompleter.h in order to define your class inheriting from wx.TextCompleter. Currently this method is only implemented in wxMSW and OSX/Cocoa (for wx.TextCtrl only, but not for wx.ComboBox). completer (wx.TextCompleter) – The object to be used for generating completions if not None. If it is None, auto-completion is disabled. The wx.TextEntry object takes ownership of this pointer and will delete it in any case (i.e. even if this method returns False). Call this function to enable auto-completion of the text using the file system directories. Unlike AutoCompleteFileNames which completes both file names and directories, this function only completes the directory names. Notice that currently this function is only implemented in wxMSW port and does nothing under the other platforms. Call this function to enable auto-completion of the text typed in a single-line text control using all valid file system paths. Returns True if undo commands are being batched. Starts batching undo history for commands. Begins using the named character style. Begins using the given point size. Begins applying a left indent and subindent in tenths of a millimetre. The subindent is an offset from the left edge of the paragraph, and is used for all but the first line in a paragraph. A positive value will cause the first line to appear to the left of the subsequent lines, and a negative value will cause the first line to be indented to the right of the subsequent lines. wx.richtext.RichTextBuffer uses indentation to render a bulleted item. The content of the paragraph, including the first line, starts at the leftIndent plus the leftSubIndent. leftIndent (int) – The distance between the margin and the bullet. leftSubIndent (int) – The distance between the left edge of the bullet and the left edge of the actual paragraph. The wx.TextAttrLineSpacing constants are defined for convenience. Begins using a specified list style. bulletNumber is a number, usually starting with 1. leftIndent and leftSubIndent are values in tenths of a millimetre. bulletStyle is a bitlist of the wx.TextAttrBulletStyle values. Begins applying the named paragraph style. Begins applying a symbol bullet. Starts suppressing undo history for commands. Returns True if selected content can be copied to the clipboard. Returns True if selected content can be copied to the clipboard and deleted. Can we delete this range? Sends an event to the control. Returns True if selected content can be deleted. Returns True if we can edit the object’s properties via a GUI. Can we insert content at this position? Sends an event to the control. Returns True if the clipboard content can be pasted to the buffer. Returns True if there is a command in the command history that can be redone. Returns True if there is a command in the command history that can be undone. Sets the new text control value. It also marks the control as not-modified which means that IsModified() would return False immediately after the call to ChangeValue . The insertion point is set to the start of the control (i.e. position 0) by this function. This functions does not generate the wxEVT_TEXT event but otherwise is identical to SetValue . value (string) – The new value to set. It may contain newline characters if the text control is multi-line. Clears the buffer content, leaving a single empty paragraph. Clears the cache of available font names. wx.richtext.RICHTEXT_SETSTYLE_WITH_UNDO: specifies that this command will be undoable. SetListStyle , PromoteList , NumberList . Sends the event to the control. Copies the selected content (if any) to the clipboard. Copies the selected content (if any) to the clipboard and deletes the selection. Deletes the content within the given range. Deletes content if there is a selection, e.g. when pressing a key. Returns the new caret position in newPos, or leaves it if there was no action. This is undoable. Deletes the content in the selection, if any. Sets the buffer’s modified status to False, and clears the buffer’s command history. Currently this simply returns wx.Size. Helper function for LoadFile . Loads content into the control’s buffer using the given type. If the specified type is wx.richtext.RICHTEXT_TYPE_ANY, the type is deduced from the filename extension. This function looks for a suitable wx.richtext.RichTextFileHandler object. Helper function for SaveFile . Saves the buffer content using the given type. Returns True if all of the selection, or the content at the current caret position, has the supplied TextAttrEffects flag(s). Edits the object’s properties via a GUI. Enable or disable the vertical scrollbar. Pass True to let the control use virtual attributes. Ends application of all styles in the current style stack. Ends batching undo command history. Ends application of a named character style. Ends using a point size. Ends using a specified list style. Ends application of a numbered bullet. Ends application of a named paragraph style. Begins applying a standard bullet. Ends suppressing undo command history. Ends applying a symbol bullet. Ends applying a text colour. Helper function for extending the selection, returning True if the selection was changed. Selections are in caret positions. Find the caret position for the combination of hit-test flags and character position. Returns the caret position and also an indication of where to place the caret (caretLineStart) since this is ambiguous (same position used for end of line and start of next). Finds the container at the given point, which is assumed to be in client coordinates. Helper function for finding the caret position for the next word. Direction is 1 (forward) or -1 (backwards). Given a character position at which there is a list style, find the range encompassing the same list style by looking backwards and forwards. The adjusted caret position is the character position adjusted to take into account whether we’re at the start of a paragraph, in which case style information should be taken from the next position, not current one. Font names take a long time to retrieve, so cache them (on demand). Gets the basic (overall) style. Returns the buffer associated with the control. Returns True if we are showing the caret position at the start of a line instead of at the end of the previous one. Returns the current caret position. Returns the caret position since the default formatting was changed. As soon as this position changes, we no longer reflect the default style in the UI. A value of -2 means that we should only reflect the style of the content under the caret. Returns the caret height and position for the given character position. If container is null, the current focus object will be used. Gets the command processor associated with the control’s buffer. Returns the current context menu. Returns an object that stores information about context menu property item(s), in order to communicate between the context menu event handler and the code that responds to it. The wx.richtext.RichTextContextMenuPropertiesInfo stores one item for each object that could respond to a property-editing event. If objects are nested, several might be editable. Returns the current default style, which can be used to change how subsequently inserted text is displayed. Gets the size of the buffer beyond which layout is delayed during resizing. This optimizes sizing for large buffers. The default is 20000. Get the possible Drag’n’Drop start point. Get the possible Drag’n’Drop start time. Returns True if we are extending a selection. Gets the current filename associated with the control. Returns the first visible point in the window. Returns the first visible position in the current view. Returns the wx.richtext.RichTextObject object that currently has the editing focus. If there are no composite objects, this will be the top-level buffer. Returns flags that change the behaviour of loading or saving. Returns the current hint string. See SetHint for more information about hints. Returns the current insertion point. Returns the selection range in character positions. Returns the last position in the buffer. Returns the length of the specified line in characters. Returns the text for the given line. Transforms physical window position to logical (unscrolled) position. Returns the margins used by the control. The x field of the returned point is the horizontal margin and the y field is the vertical one. If given margin cannot be accurately determined, its value will be set to -1. On some platforms you cannot obtain valid margin values until you have called SetMargins . Transforms logical (unscrolled) position to physical window position. Are we trying to start Drag’n’Drop? Gets the object’s properties menu label. Gets the text for the given range. The end point of range is specified as the last character position of the span of text, plus one. Returns an overall scale factor for displaying and editing the content. Returns the range of the current selection. The end point of range is specified as the last character position of the span of text, plus one. If the return values from and to are the same, there is no selection. Returns an anchor so we know how to extend the selection. It’s a caret position since it’s between two characters. Returns the anchor object if selecting multiple containers. -1, -1 means no selection. Returns the text within the current selection range, if any. Gets the attributes at the given position. This function gets the combined style - that is, the style you see on the screen as a result of combining base style, paragraph style and character style attributes. To get the character or paragraph style alone, use GetUncombinedStyle . Gets the attributes common to the specified range. Attributes that differ in value within the range will not be included in style flags. Returns the style sheet associated with the control, if any. A style sheet allows named character and paragraph styles to be applied. Returns the text (normal) cursor. Returns the cursor to be used over URLs. This function gets the uncombined style - that is, the attributes associated with the paragraph or character content, and not necessarily the combined attributes you see on the screen. To get the combined attributes, use GetStyle . If you specify (any) paragraph attribute in style’s flags, this function will fetch the paragraph attributes. Otherwise, it will return the character attributes. Returns the content of the entire control as a string. Returns True if the vertical scrollbar is enabled. Returns True if this control can use virtual attributes and virtual text. Internal helper function returning the line for the visible caret position. If the caret is shown at the very end of the line, it means the next character is actually on the following line. So this function gets the line we’re expecting to find if this is the case. If any of the attributes are different within the range, the test fails. You can use this to implement, for example, bold button updating. style must have flags indicating which attributes are of interest. Returns True if there is a selection and the object containing the selection was the same as the current focus object. Returns True if there was a selection, whether or not the current focus object is the same as the selection’s container object. Finds the character at the given position in pixels. pt is in device coords (not adjusted for the client area origin nor for scrolling). Initialises the members of the control. Invalidates the whole buffer to trigger painting later. Returns True if the user has recently set the default style without moving the caret, and therefore the UI needs to reflect the default style and not the style at the caret. Below is an example of code that uses this function to determine whether the UI should show that the current style is bold. Returns True if the control is editable. Returns True if the control is currently empty. This is the same as GetValue .empty() but can be much more efficient for the multiline controls containing big amounts of text. Returns True if the buffer has been modified. Returns True if the control is multiline. Returns True if the given position is visible on the screen. Returns True if all of the selection is aligned according to the specified flag. Returns True if all of the selection, or the content at the caret position, is bold. Returns True if all of the selection, or the content at the caret position, is italic. Returns True if all of the selection, or the content at the caret position, is underlined. Returns True if the control is single-line. 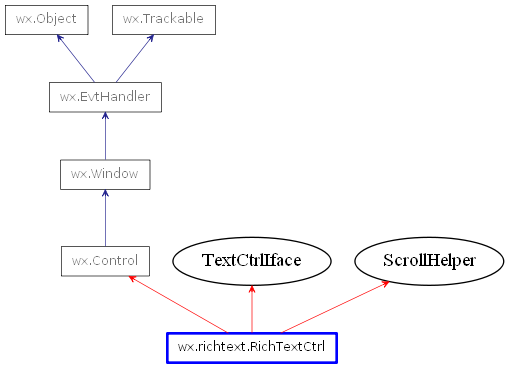 Currently wx.richtext.RichTextCtrl does not support single-line editing. Helper function implementing keyboard navigation. Lays out the buffer, which must be done before certain operations, such as setting the caret position. This function should not normally be required by the application. Inserts a line break at the current insertion point. A line break forces wrapping within a paragraph, and can be introduced by using this function, by appending the Char value RichTextLineBreakChar to text content, or by typing Shift-Return. Marks the buffer as modified. Move the caret to the given character position. Please note that this does not update the current editing style from the new position; to do that, call wx.richtext.RichTextCtrl.SetInsertionPoint instead. Move the caret one visual step forward: this may mean setting a flag and keeping the same position if we’re going from the end of one line to the start of the next, which may be the exact same caret position. Moves to the end of the buffer. Moves to the start of the buffer. Moves to the end of the line. Moves to the start of the line. Moves to the start of the paragraph. Inserts a new paragraph at the current insertion point. wx.richtext.RICHTEXT_SETSTYLE_RENUMBER: specifies that numbering should start from startFrom, otherwise existing attributes are used. wx.richtext.RICHTEXT_SETSTYLE_SPECIFY_LEVEL: specifies that listLevel should be used as the level for all paragraphs, otherwise the current indentation will be used. SetListStyle , PromoteList , ClearListStyle . Standard handler for the wx.ID_CLEAR command. Shows a standard context menu with undo, redo, cut, copy, paste, clear, and select all commands. Standard handler for the wx.ID_COPY command. Standard handler for the wx.ID_CUT command. Loads the first dropped file. Standard handler for the wx.ID_PASTE command. Standard handler for property commands. Standard handler for the wx.ID_REDO command. Standard handler for the wx.ID_SELECTALL command. Standard handler for the wx.ID_UNDO command. Standard update handler for the wx.ID_CLEAR command. Standard update handler for the wx.ID_COPY command. Standard update handler for the wx.ID_CUT command. Standard update handler for the wx.ID_PASTE command. Standard update handler for property commands. Standard update handler for the wx.ID_REDO command. Standard update handler for the wx.ID_SELECTALL command. Standard update handler for the wx.ID_UNDO command. Moves one or more pages down. Moves one or more pages up. Other user defined painting after everything else (i.e. all text) is painted. Pastes content from the clipboard to the buffer. Pops the style sheet from top of stack. Internal function to position the visible caret according to the current caret position. Converts a text position to zero-based column and line numbers. Called by the same function in wx.richtext.RichTextBuffer. Currently is only called if undo mode is on. Prepares the context menu, optionally adding appropriate property-editing commands. Returns the number of property commands added. Processes mouse movement in order to change the cursor. Promotes or demotes the paragraphs in the given range. Push the style sheet to top of stack. Refreshes the area affected by a selection change. Removes the content in the specified range. Replaces the content in the specified range with the string specified by value. This function takes a caret position. Selects the word at the given character position. Sets attr as the default style and tells the control that the UI should reflect this attribute until the user moves the caret. Sets a flag to remember that we are showing the caret position at the start of a line instead of at the end of the previous one. The caret position is the character position just before the caret. A value of -1 means the caret is at the start of the buffer. Please note that this does not update the current editing style from the new position or cause the actual caret to be refreshed; to do that, call wx.richtext.RichTextCtrl.SetInsertionPoint instead. Sets up the caret for the given position and container, after a mouse click. Set the caret position for the default style that the user is selecting. Sets the current context menu. Sets the current default style, which can be used to change how subsequently inserted text is displayed. Sets the default style to the style under the cursor. Sets the size of the buffer beyond which layout is delayed during resizing. Set the possible Drag’n’Drop start point. Set the possible Drag’n’Drop start time. Sets a flag to remember if we are extending a selection. Makes the control editable, or not. Sets the wx.richtext.RichTextObject object that currently has the editing focus. obj (wx.richtext.RichTextParagraphLayoutBox) – The wx.richtext.RichTextObject to set focus on. setCaretPosition (bool) – Optionally set the caret position. Sets the font, and also the basic and default attributes (see wx.richtext.RichTextCtrl.SetDefaultStyle ). Sets a hint shown in an empty unfocused text control. The hints are usually used to indicate to the user what is supposed to be entered into the given entry field, e.g. a common use of them is to show an explanation of what can be entered in a wx.SearchCtrl. The hint is shown (usually greyed out) for an empty control until it gets focus and is shown again if the control loses it and remains empty. It won’t be shown once the control has a non-empty value, although it will be shown again if the control contents is cleared. Because of this, it generally only makes sense to use hints with the controls which are initially empty. Notice that hints are known as cue banners under MSW or placeholder strings under OS X. For the platforms without native hints support (and currently only the MSW port does have it and even there it is only used under Windows Vista and later only), the implementation has several known limitations. Notably, the hint display will not be properly updated if you change wx.TextEntry contents programmatically when the hint is displayed using methods other than SetValue or ChangeValue or others which use them internally (e.g. Clear ). In other words, currently you should avoid calling methods such as WriteText or Replace when using hints and the text control is empty. Hints can only be used for single line text controls, native multi-line text controls don’t support hints under any platform and hence wxWidgets doesn’t provide them neither. Sets the insertion point and causes the current editing style to be taken from the new position (unlike wx.richtext.RichTextCtrl.SetCaretPosition ). Sets the insertion point to the end of the text control. Sets the selection range in character positions. NumberList , PromoteList , ClearListStyle . Attempts to set the control margins. When margins are given as wx.Point, x indicates the left and y the top margin. Use -1 to indicate that an existing value should be used. True if setting of all requested margins was successful. Sets the maximum number of characters that may be entered in a single line text control. For compatibility only; currently does nothing. Set if we’re trying to start Drag’n’Drop. wx.richtext.RICHTEXT_SETPROPERTIES_WITH_UNDO: specifies that this operation should be undoable. wx.richtext.RICHTEXT_SETPROPERTIES_PARAGRAPHS_ONLY: specifies that the properties should only be applied to paragraphs, and not the content. wx.richtext.RICHTEXT_SETPROPERTIES_CHARACTERS_ONLY: specifies that the properties should only be applied to characters, and not the paragraph. wx.richtext.RICHTEXT_SETPROPERTIES_RESET: resets (clears) the existing properties before applying the new properties. wx.richtext.RICHTEXT_SETPROPERTIES_REMOVE: removes the specified properties. Sets an overall scale factor for displaying and editing the content. Sets the selection to the given range. So, for example, to set the selection for a character at position 5, use the range (5,6). Sets an anchor so we know how to extend the selection. Sets the anchor object if selecting multiple containers. So, for example, to set the style for a character at position 5, use the range (5,6). Sets the attributes for a single object. Sets the attributes for the given range, passing flags to determine how the attributes are set. The end point of range is specified as the last character position of the span of text, plus one. So, for example, to set the style for a character at position 5, use the range (5,6). wx.richtext.RICHTEXT_SETSTYLE_WITH_UNDO: specifies that this operation should be undoable. wx.richtext.RICHTEXT_SETSTYLE_OPTIMIZE: specifies that the style should not be applied if the combined style at this point is already the style in question. wx.richtext.RICHTEXT_SETSTYLE_PARAGRAPHS_ONLY: specifies that the style should only be applied to paragraphs, and not the content. This allows content styling to be preserved independently from that of e.g. a named paragraph style. wx.richtext.RICHTEXT_SETSTYLE_CHARACTERS_ONLY: specifies that the style should only be applied to characters, and not the paragraph. This allows content styling to be preserved independently from that of e.g. a named paragraph style. wx.richtext.RICHTEXT_SETSTYLE_RESET: resets (clears) the existing style before applying the new style. wx.richtext.RICHTEXT_SETSTYLE_REMOVE: removes the specified style. Only the style flags are used in this operation. Sets the style sheet associated with the control. Sets the text (normal) cursor. Sets the cursor to be used over URLs. Replaces existing content with the given text. A helper function setting up scrollbars, for example after a resize. Return True from here to allow the colours of this window to be changed by InheritAttributes . Returning False forbids inheriting them from the parent window. The base class version returns False, but this method is overridden in wx.Control where it returns True. Shows the given context menu, optionally adding appropriate property-editing commands for the current position in the object hierarchy. Scrolls the buffer so that the given position is in view. Returns True if undo history suppression is on. Undoes the command at the top of the command history, if there is one. Moves a number of words to the left. Move a nuber of words to the right. Writes a field at the current insertion point. fieldType (string) – The field type, matching an existing field type definition. properties (wx.richtext.RichTextProperties) – Extra data for the field. textAttr (wx.richtext.RichTextAttr) – Optional attributes. Write a bitmap or image at the current insertion point. Supply an optional type to use for internal and file storage of the raw data. Loads an image from a file and writes it at the current insertion point. Writes an image block at the current insertion point. Write a table at the current insertion point, returning the table. You can then call SetFocusObject to set the focus to the new object. Writes text at the current position. Write a text box at the current insertion point, returning the text box. Translates from column and line number to position.